Through the Growth and Evolution of Our Practice in a Complex Time in the Economy and Financials we have spent a significant amount of time and resources to the purpose of better connecting the relevant lines of our understanding on the interfunctioning points of Macro and Micro Financials, Legal and Technology in the Economy and Financials as support lines to Teamwork and Strategic and Operational points from which to help on improvements in the Economy and Financials with a line of People Power Potential support as our takeaway to the value points to optimally support teamwork. Cross Sector Financial and Societal Research is an integral part of our skills to better connect to needs for cross sector leadership, management, staff training, development and outreach to help on cross sector societal needs in the Economy and Financials. We are creating a break out menu item here to cover the evolving significance of these skills to the overall lines as in every line of Business Communications, Public Relations, Outreach, Awareness and Teamwork is a critical element of success built on effective communications for strategic and operational needs in the Economy and Financials. DCarsonCPA CALs / Creative Arts lines on Instagram specific lines for Creative Arts and other cross sector lines exploring the connection of Creative and Commercial Arts on the Outreach Cycle for Client support Business, Non Profit, NGO, Govt, Community and Societal needs in the Economy and Financials. DCarsonCPA MFC and DCarsonCPA MFC One lines these are the lines from the Lean Machine with the value takeaways and support from DCarsonCPA Global Lines to use the real time knowledge of innovation reseach to integrated value points where we can help in the Economy and Financials. On the Aggregate line of valid, eligible opportunities between the relevant point constraints of the needs on growth and prudent risk management in the Economy and Financials. On Services, Applied Research and Message to help on teamwork and outreach. DCarsonCPA MFC Street Team on Growth Lines (Exploratory lines on brand support as ramp up for start ups and SMEs on lean cycles or SMEs and Large Entities seeking a new and innovative Approach to outreach for awareness). Contact Us or email info@dcarsoncpa.com to learn more. We are working with a forward look to the next chapter on the lines of Integrated Economic, Financial, Legal and Technology Research. Our lines work for lean support of Economic Research AND on demand needs on Services and Applied Research. In context to value on message on communications the knowledge of Economics, Policy, Financials, Tax and Compliance places value in context to needs where Technology and Teamwork meet in the Economy on Data, Communications and Financials lines for the Strategic and Operational needs of Entity and the Broad lines needs for the Economy in support of Individuals, Families and Communities. We can help on many lines of support services. 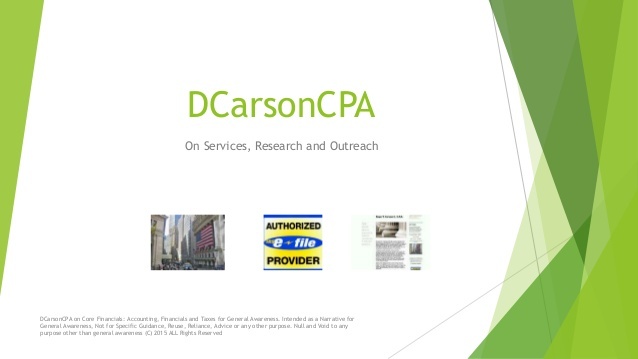 Find info@dcarsoncpa.com or contact us. Growth and Risk Management Research on Innovation, Entrepreneurial, SME and Fortune 500 needs. Where Our Value on Message Corresponds to Deep Understanding of Entity and Societal needs for Communities at Home and Abroad where the underlying value of Freedom and Liberty is a critical point that relates to Rugged Individualism and Shared Accountability for the best of points on teamwork for Shareholders and broader Stakeholders in the Economy and Financials. For the valid and eligible points of no conflict to needs on Independence and Integrity there exist many valid points on Business, Non Profit and Governmental support services where we can help on broader needs that we ALL see for Individuals, Families and Communities for Opportunities and Growth in the Economy and Financials along with Prudent Risk Managemnt that includes core values lines in support to the important lines of shared needs at home and abroad. We work with deep lines on Global Communications, Public Relations, Board, Director, Senior Executive, Executive, Legislative, Judicial and Relationships on Trade and Global Teamwork to help on the Economy through the value added lines of Entities which support Individual, Family and Community needs and outbound lines for Trade, Development Finance and Global Teamwork for Humanity. Our value on messag includes deep lines on the Financials at work and more than 5 years on the message lines of Cross Sector needs in the Economy and Financials. Support lines on Communications, Outreach and Awareness for Cross Sector needs in the Economy and Financials. 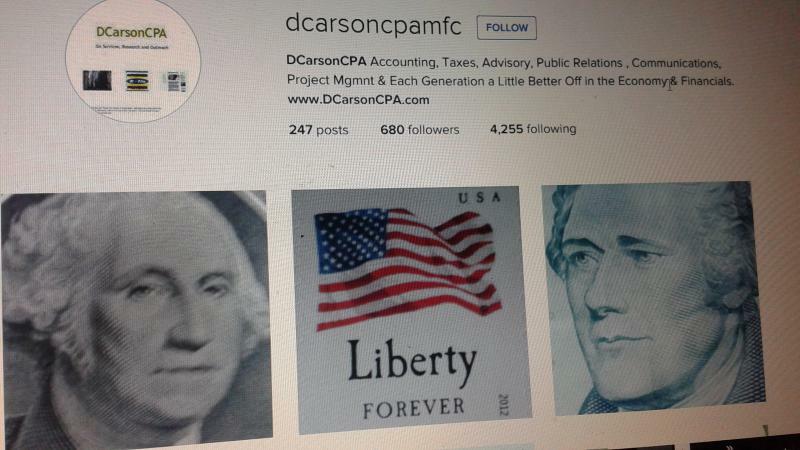 DCarsonCPA PRTC Lines Daily on Public Speaking in the Economy and Financials. DCarsonCPA on Accounting Policy (elements from Our lines on Economic Research).